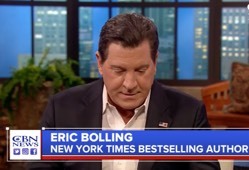 Bolling, a former Fox News personality, and best-selling author was interviewed by Pat Robertson on Monday's 700 Club. Bolling said, "You called, you reached out at a very important time in my and my wife's struggle through this tragedy," he said. "Thank you for praying with us." His 19-year-old son Eric Chase Bolling died while attending the University of Colorado. His father saw no signs of a drug problem and said his son's death took him completely by surprise. "Second year of school, terrific grades, no indication of anything," he said. Bolling said an autopsy revealed his son took a pill containing a lethal amount of an opioid. "He was at college. He took a Xanax, which apparently, I didn't know this until now, is what a lot of college kids do to relax." he continued. "This Xanax happened not to be prescriptive. It was laced with Fentanyl. It was a Chinese knock-off that was produced in China but had Fentanyl in it to make it stronger. 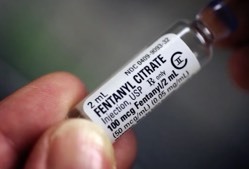 Fentanyl is a very, very strong opioid." Just a tiny amount of Fentanyl can be deadly. It's often added to a number of street drugs, such as heroin, to make them stronger. "In the weeks following that, Pat, you were amazing. You reached out to us. We were in the depths of grief and didn't know where to go. You and I sat on the phone several times and prayed. Thank you for that," he said. Bolling said within 24 hours of his son's death he received a phone call from President Trump. "I've been friendly with the president for a long time. The president said, 'Eric there's nothing I can do to make this feel better. Just know that you have my support,'" he recalled. Weeks later, on Thanksgiving Day, Bolling said President Trump called him again, saying, "I'm just thinking about how this is the first holiday without your son. If there's anything I can do, let me know." Bolling said the call meant a lot to him. "I realized at that moment that President Trump has compassion, he's caring, he has empathy for people who are going through what my wife and I are going through." Since his son's death, Bolling has worked with the president to combat the opioid epidemic. Bolling produced a video presented at the White House Opioid Summit last month. "It's a new push to create awareness across the country among both parents and their children." "Parents need to be removed from this whole, 'not my kid' syndrome,'" which he said is a form of denial about a child's vulnerability to opioids. He continued, "Parents think their kid is too popular, too smart or too athletic," adding opioid overdose deaths can happen the first time a person takes a drug. "From the kids' standpoint, I don't think a lot of young people realize that one pill can kill. And that's what happened, unfortunately, with our son. He took a pill. It was one pill and he didn't wake up." The Trump administration has declared the opioid epidemic a "public health emergency" and has secured $6 billion to tackle the crisis, with plans to launch anti-drug commercials, grant waivers to states for treatment, and even to provide free Narcan, a drug that counteracts the effects of a drug overdose, to schools and colleges. The president also wants to fortify the southern border, where many opioids enter the country. And he's calling on Homeland Security to look into ways of stopping opioids from being sent through the mail.